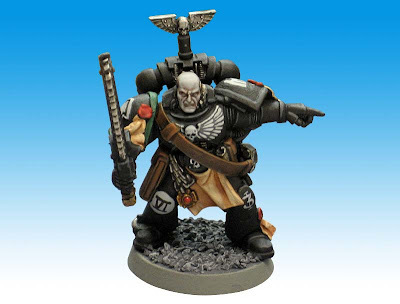 A while ago, I ended up with the task of converting the Sergeant model from the Black Reach boxed set (At least I think that's where he's from). Not a terribly difficult conversion I thought, but one that proved trickier than I imagined. The task was simple, sling a bolter over his shoulder so he is WYSIWYG. And so I set about positioning the bolter and creating a sling out of plasticard. My first attempt (shown above) was not bad, but the sling lacked a little bit of life to it and looked a little stiff readers thought. For my second attempt, I wanted to see if I could add a little more life into the sling and make it appear as though it were holding the weight of the bolter as it conformed to the shape of the armour underneath. It's the one aspect I did not capture all that well on the first model. The first thing did was position the bolter again and I opted to use a thinner (in terms of thickness) piece of plasticard for the sling. This allowed me to better "form" it on the model. Looking at the picture now, I can see that the front does not show the form of the sling as well as the back portion does. 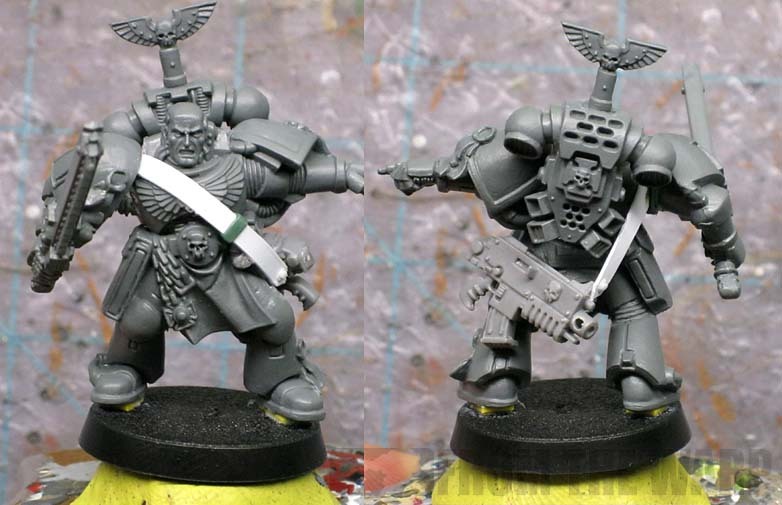 Just being able to add a slight twist here and there as the sling moves over his torso does wonders for making it look as though it was meant to be there and is actually supporting the weight of the bolter. All in all, it's not a tough conversion to do, it just requires some patience in working the plasticard over the surface of the model. You don't see many slung weapons in the game and it makes for a nice change to see it on a model. Getting the plasticard to attach to the weapon can be tricky and results in a some fragile connections, but nothing game ending that would keep you away from using him to play with. And for the keen eye, you can see where I've repositioned his chainsword arm a bit more forward and placed him up on spacers so he won't look as though he sinking when he is based. simon duce: Never thought about the foil. I wonder how that would hold up to game play though. I used to use the lead foil from wine bottles for metal plates, capes, straps, etc. It holds up quite well but it can be a bit tricky to affix without pinning. Newer wine bottles use an aluminum foil that isn't quite as thick and a little more rigid than the lead foil was. It's a bit thicker than the stuff you get on a roll though so it should still work. You can still order lead foil, however, from a lot of modelling shops. Alternatively, you could cover the plasticard strip in a bit of tissue that's been soaked in thinned down glue, giving it another texture and mimicking a cloth strap. I've always tried similar conversions with GS. Instead of having to cut&flex the plastic, I simply mold the Gs into the form I need. My attempts are usually only small segments, to show how a Cape is attached. So I guess thats the difference. I use brass strips. Sometimes leftover bits cut to shape, sometimes I buy 1/35 scale brass slings and cut down slightly. I know this doesn't have anything to do with the strap itself, but what do you use as the spacer. I've been struggling with a medium from basing around the model and gluing the model on top. Neither look right and it seems like your spacer technique would be amazing! I use dental tape (basically dental floss, but wide and flat) for straps and cloth wraps. I did this on some ogryns I made but on marines I don't understand it. All the books have them mag locking the bolter to a hip so I'm not sure why sternguard etc. have slings. I should add that I do understand why you did it (and mag lock hips don't really fit on models) - just that I don't understand why the sternguard have slings on the ones they're holding. I've been told by other hobbyists that some toothpaste tubes are made out of a material that works like lead foil - it bends easily, holds shape to contours, etc. Zab: I never thought about brass. That might be perfect. Nostok: I've read about the magnetic clips as well, but I just don't like the way the equipment looks like it's "floating" there. Even though I don't need the straps, I often add them as a visual clue. Narric: I tried greenstuff first, but for some reason found it to be a giant pain to work with that day. ServvsUmbrarum: It's a simple piece of plasticard I cut from a plastic yard sale sign I bought at a hardware store. Super cheap and easy to do. Mike Howell: I've never heard of using that before. TheAmbit: That's a good point. I prefer the look of a sling as opposed to that floating look you can get on the model when they use the "mag locks." I suppose the mag lock method may be a bit more accurate in the end though. HeadHunter67: I'm just about done with the tube of toothpaste I have now at home. I may have to cut it up once it's gone to see what it's like. The Toothpaste tube hint is a good one... Most are plastic these days but you can find the metal ones they would make a perfect material. I agree, I'm waiting for our toothpaste tube at home to run out so I can cut it up. I don't know what thickness of card you are working with but I'd found the really lean stuff works very well. I'd used brass and lead foil in the past but I've found very thin plasticard preferable to either. Unfortunately I don't have the measurement (I bought a sheet from the hobby shop so no packaging). It's light enough that it can be teased into curves and bends from the friction of running it between fingers or over a round (pencils, sculpting tools) and once it has been shaped to hang right fuses perfectly with other plastic components (I don't miss monkeying around bonding foils with super glue). As well as straps this has worked very well for baltevs and other romanesque accents. Anon: I too like the plasticard approach. Perhaps it's my inability to use the material that is keeping me from getting the most from it. Either way you look at it, there seems to be a number of options to solve this one depending on which method you've used before and what you're most comfortable with.